"Versatile transitional style...durable, easy-clean painted wood so your child will feel comfortable in a bed that resembles his former crib." "Whether you have a Disney Princess lover or a Ninja Turtles fan, you'll find a bed decorated in your child’s favorite characters." "A bed with safety rails that encompass most of the bed, comes in nine colors...can convert to two chairs and a table." "Twin beds can be tucked up against each other or separated without losing too much floor space if your twins tend to keep each other up." "Includes one large drawer the full length of the bed...divided into two halves to keep things organized." "Adorable, super pink, and is a four poster, each topped with a golden crown." "Comes in three color options...based on classic wrought-iron furniture, it's decidedly modern." The best toddler bed is one that seamlessly transitions the room from a nursery to little-kid space. A versatile style that works with your existing decor will be your best bet. Painted wood is a durable, easy-clean material that can hold up to a rambunctious toddler. The Dream On Me Classic Toddler Bed comes in 10 color options, so it’s easy to fit your nursery decor or choose your child’s favorite color! The styling on this bed is a simple, transitional style. The semi-enclosed rails and head and footboard mimic crib rails, so your child will feel comfortable in a bed that resembles his former crib. The style ensures that it will work just as well mixed ​in with more ornate traditional American furniture as it would with an eclectic, modern nursery design. 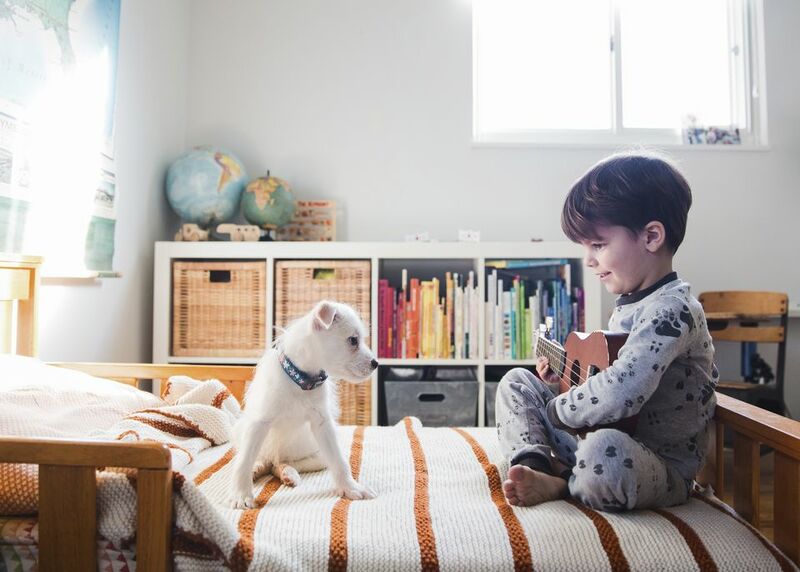 If you know you’re only going to use a toddler bed for a few years, you might not want to invest much money in it—and that’s totally fine! All toddler beds sold in the U.S. are subject to the same safety regulations. You can rest assured your child will be just as safe in a less-expensive bed than a splurge-y one. You just might get the biggest bang for your buck from a bed decorated in your child’s favorite characters! This is especially true for a child who’s having trouble with the idea of giving up his crib. A bed that has a few friendly faces from his favorite shows might be enough incentive to try the big-kid bed—and hopefully, stay in it! The Delta Children Plastic Toddler Bed fits all those needs. It's very affordable and is available in 26 colorful styles. Whether you have a Disney Princess lover or a Ninja Turtles fan, you're sure to find the perfect bed for your little one. All toddler beds have some kind of mechanism for keeping kids in place. A child who is resisting the transition bed might be most comfortable in a bed that’s as similar as possible to his little-kid crib. In that case, look for a bed with rails that encompass most of the bed to make him feel cozy and safe. While your child will still be able to get out easily when he needs to, a bed with more railings can also deter an active child from hopping out of bed whenever he wants to. This bed from Dream On Me comes in nine colors and includes those safety rails. When your child grows out of it, you can convert it to two chairs and a table. For the price, it's hard to beat the investment in a piece of furniture that can last well past their toddler years. If you’re upgrading twins from cribs to toddler beds, you’re probably on the lookout for space-saving options. Unfortunately, at this age, your children are too young for bunk beds (you’ll have to wait until they’re at least five for those). Until you can get two beds in the space for one, look for a streamlined pair of beds. Two Delta Children Abby Toddler Beds can be tucked up against each other if your twins like to sleep together. They can also be separated without losing too much floor space if your twins tend to keep each other up. This classic bed has minimal rails, no footboard, and no flourishes to take up extra space. It allows both children to be comfortable in the most compact way. If your child’s room is tight on space, look for a toddler bed that integrates storage for linens, clothes, or toys. The easiest place to create this storage is under the bed. Luckily, some manufacturers have put a large drawer there so you can pull out to access the storage. You can also find toddler beds with bookshelves or cube storage built into the foot of the bed. The Dream On Me Toddler Day Bed includes one large drawer the full length of the bed. It's divided into two halves to keep things organized. The daybed-style bed comes in 5 classic furniture colors. It might also be a good option for kids who are nervous about the new bed because the rails on three sides can make them feel enclosed and safe. Are you ready to make your pink-tastic little girl’s dream come true? A princess bed may be just the thing! If you have a daughter who would enjoy this kind of bed, you probably already know it. While it may seem like a wild indulgence to put her in a bed this pink and gold, most parents will tell you that the best bed for your child is the one they can’t wait to sleep in! The KidKraft Princess Toddler bed is the perfect way to sell your little princess on a big-girl bed. It's adorable, super pink, and is a four poster, each topped with a golden crown. With this one, she’ll be the envy of all her toddler friends. Metal beds are a fresh alternative to painted wood or plastic beds that can have more of a furniture feel than some other toddler bed options. They’re also a trend-forward design that works surprisingly well with both traditional and modern decor. If you want your toddler’s room to be Instagram-worthy, this bed may do the trick! Painted metal is also a durable material that will hold up just as well as wood if you anticipate passing the bed down from one sibling to the next. The Little Seeds Monarch Hill metal bed comes in three color options. While it is based on classic wrought-iron furniture, it's decidedly modern. The company also supports environmental causes, so you can feel extra-good about your purchase.